It’s hard to imagine Dun Gifford as anything other than to remember him loping across a room, bee-lining me or anyone else he was happy to see, with a big, rib crusher of hug, and a “life is fabulous” beam on his face. I realized when I heard that Dun had died, still breathless from a trip to Australia (and wherever else he’s been in the last twelve minutes), I didn’t actually believe it. He couldn’t be dead. Dun was one of the immortals. So, I remember Dun with a copy of the profile I wrote of him for Boston Magazine in 1998. It was tetchy interviewing for that piece. Dun disquieted some of the greatest names in the food world. But he was impossible to dislike and yet he rankled a lot of the more purist members of the fooderati. But ultimately Dun accomplished a huge task –he catalyzed a community of scientists, cooks, chefs, food writers, wine writers and made friends from coast to coast, continent to continent. My hand over my heart for his kids, for Sara, and for Pebble. He is a hard loss. K. Dun Gifford may well be Boston’s answer to Forrest Gump. A mature version of the smart and cheerful captain of the football team at an old-line Yankee boarding school, Dun Gifford just keeps cropping up all over the place. On June 25th, 1956, the young Dun Gifford and his family were on the Andrea Doria the night it collided with The Stockholm and sank. In ‘68, Gifford was in San Francisco cradling Robert Kennedy’s head when he was assassinated, and he was once again on the scene in Chappaquiddick in 1969 to identify Mary Jo Kopechne’s body and accompany her casket home to Pennsylvania. Gifford sailed on one of the defenders of the America’s Cup. He built office parks and shopping centers, and helped manage the Ritz Carlton Hotel. Now, the six-foot-four and a half-inch-sixty-year old patrician hopes to be on the scene of another major event in America, the revolutionizing of its eating habits. In particular the kind of fat you eat. Not the amount, just the type. You have Dun Gifford and his colleagues at Oldways Preservation Trust to thank for the proliferation of those cute little carafes of extra virgin olive oil now served with your bread basket instead of butter. He wants you to vote with your fork. Leaning back in his chair, leg extended to nurse a knee injury, Gifford expostulates in an exposed brick and wood beamed office Oldways in East Cambridge, with the kind of bonhomie that makes some guys cringe – as if they are re-visiting their experience as third-string bench warmers on the freshman squad. Never one to think small, Gifford founded the Oldways Preservation and Exchange Trust in 1988, because he became convinced that Americans were killing themselves by what they put in their mouths. As someone with a life long passion for food (one of his earliest memories is of sitting in his grandmother’s Rhode Island kitchen and listening to the cook puzzle over how to make a cake with “no white flour” as per grandma’s decree), and a personal history of “being an agent for social change”, Gifford set out to change our eating habits “one forkful at a time”. With Gifford playing Elmer Gantry, Oldways has launched an almost evangelical campaign to tell the world that they way we used to eat is the way we should be eating. Using his considerable charm and marketing instincts, Gifford and his band organize mega scientific and culinary conferences in exotic surroundings around the world bringing together influential food writers, chefs, nutritionists and physicians among others to educate them on the physiological and sensual superiority of what people ate before there were supermarkets and food courts. Once convinced, these opinion leaders go forth and spread the gospel. The gospel is called the Mediterranean Diet Pyramid. The Mediterranean Diet mimics the traditional eating patterns of Crete, Greece and Southern Italy. It’s a plant based diet which relies on lots of olive oil, legumes, grains and vegetables and only small amounts of meats and sweets and it’s also a diet which public health research declares will drastically reduce the rate of chronic diseases such a heart disease and cancer in America. Bolstered by the support and blessing of the World Health Association and the Harvard School of Public Health, Gifford and Oldways have gone to war against the USDA and its familiar Basic Four Food Group pyramid (the one you memorized in your Junior High Health class) and developed its own rival pyramid, the Mediterranean Diet Pyramid. Unlike the USDA guidelines, which lump all proteins in one group, and all fats and carbohydrates in another, the Oldways Pyramid differentiates between the kinds of proteins and the kind of fats, advising carnivores to substitute chickpeas for chicken, and olive oils for butter. But it is not a no-drinking no-fun vegetarian diet, Oldways simply recommends reducing the servings of red meat to a few times per month, and servings of poultry and fish to a few times per week. Oldways even recommends a daily glass or two of wine as a boon to mankind. Their most revolutionary tenet is that unsaturated fats like olive oil should account for thirty per cent or more of our caloric intake and that a plant oil based is in fact healthier than a non-fat regimen. “We don’t talk about carbohydrates – we talk about potatoes and yams. Cheese and nuts. There’s no carbohydrate or protein aisle in the supermarket,” says Gifford. “ If you talk about carbohydrates – people just tune out. Initially, the people in the nutrition establishment hated us because we were challenging the whole basis of their approach – invite a calculator and your girlfriend to lunch”. Ten years into the campaign, the USDA has begun to re-write the rules for healthy eating and re-jigger their pyramid to resemble Oldway’s. Dr. Walter Willett, chair of the Department of Nutrition and professor at the Harvard School of Public Health says, “Dun Gifford has built an essential bridge between nutritional scientists and those who make the menus and prepare the food…Oldways has made an enormous contribution to the public’s understanding of a healthful diet…dispelling the phobias about fat”. Gifford wasn’t fazed in the least bit by taking on the nutrition establishment. He figures that he’s been preparing for this battle throughout his whole eclectic life. Born in 1938 in Providence to a family that traces its blood lines back to John Brown and the Quakers who founded Rhode Island, blue-eyed blonde Gifford was the oldest son in a family with high expectations for their children. “I still can see the chair my mother sat in when she told me to remember that I came from a family that was given much and gave back more. A family that had produced senators and governors and that as the oldest, I was probably the one to carry the torch for civic responsibility”. Clearly, the parental messages for success and excellence hit home with all three Gifford boys. Younger brother Jock is a successful businessman on Nantucket, and little brother Chad runs BankBoston. Sister Bambi is a (tk). But in addition to the spine-straightening stuff, Dun Gifford’s parents also produced a self-described sensualist who can “still smell the pies baking and the bread rising” in his grandparents home where he lived with his mother while his father was off fighting World War II. He remembers the Sunday after-church roast lamb dinners with mint jelly, clamming and fishing with his family on Nantucket, and the beach-plum jelly the family made and the boys sold by the roadside as part of their contribution to buy “at least the hubcaps” for the family jeep. He also recalls when his Dad, a crusty Scots Presbyterian from Kentucky (who was by then President of Rhode Island Hospital Trust, the bank that became Fleet), decided to start a wine cellar in 1948, “taking the grown men downstairs for a tour and coming upstairs laughing”. Wine got to be part of the sensual thing for Dun too. The food thing stayed with Dun, even as he went off to boarding school at St. George’s and Harvard College. He still savored his Nantucket summer excursions to go blueberry picking with his father and sibs and to the farmer’s market with his Mom. “Dun was always very interested in family roots and tradition, ” brother Chad says. But the conventional expectations for a big, smart and privileged male WASP captured his career next. Graduating from college in 1960, he enlisted in the Navy. When Gifford returned to Boston three years later for law school at Harvard, he was already a husband and father, having married Gladys, (universally called Pebble), now a successful Cambridge real estate agent and community activist who is one of the prime movers of the Harvard Square Defense Fund, a group that among other agenda items, keeps fast-food restaurants out of Harvard Square. Although Gifford says it was not his intention to go into the public sector after law school, he spent one of his Summer vacations in law school working in Washington as a legislative assistant for Rhode Island Senator, Claiborne Pell. The stint in Washington led his mentor and law school Professor Charles Harr to tap Gifford as his assistant to help draft the legislation for President Johnson’s Task Force on the Cities, the legislation which enabled the office of Housing and Urban Development. “Johnson was a little loony,” Gifford says, “ dispatching jet planes to pick us up in Boston and fly us to Chicago to meet people he thought we should get to know. Pretty heady stuff for a law student”. Heady enough for Gifford to turn down a right-out-of-law school job with Goodwin, Proctor & Hoar and return to Washington to work for full-time HUD in 1966 as it was being founded. By 1970, Dun and his growing family got tired of the psychic rewards of public sector life (“It’s hard for a guy with three little boys to live on $17,000 a year”), and returned to Boston and a corporate career as a Vice President and Assistant to the Chairman of Cabot, Cabot & Forbes, Gerald Blakey. Blakely, (who has since sold CC&F to the Marshall Field Company), describes Gifford “as a brilliant and creative person with terrific instincts” Blakeley also remembers Gifford as “a born evangelist with a great interest in food”. Developer Don Chiofaro, who worked at CC&F at the same time as Gifford says that “CC&F was a special kind of development company and a great incubator for entrepreneurs. It’s not a surprise that people like Mort Zuckerman, Federico Mansfield-Colloredo, and Dun Gifford came out of it. It doesn’t surprise me that Dun is taking on the world…he was always a big thinker”. Gifford ran CC&F division that built skyscrapers for a year. But Gifford’s legal background and recent Washington experience was fresh and valuable, and he became Blakely’s resource for the zoning and permitting issues that surrounded CC&F development projects from Arizona to Route 128. Gifford’s favorite part of his eight year CC&F tour, was his association with the Ritz Carlton, which CC&F owned, and his developing friendship with the legendary Charles Ritz. “Managing the Ritz was a job that fell to the most junior partner because hotels weren’t seen as important holdings like office towers”. Ritz and Gifford fell in love. Ritz invited Gifford to Paris to spend two weeks each summer in the hotel as his guest. “Ritz was on a mission to educate me. We went roof to sub-basement at the Ritz in Paris. He showed me the room where they kept all the recipes from the Ritz from time immemorial”. Gifford calls Ritz “wonderfully obsessive” and characterizes their relationship as one of the turning points in his life. In 1972, motivated by a deep interest in open space planning, and egged on by Ted Kennedy, “Ted told me that Jack had always wanted to extend the Cape Cod National Sea Shore”, Gifford says, he researched and wrote a federal bill, the Nantucket Sounds Islands Trust, to protect the more fragile parts of the peninsula and the Island from overdevelopment. It did not pass the senate. “It was tragic. We came so damn close, but Nixon was President and the Senators from the West like Alan Simpson were afraid of the precedent the bill would set”, Gifford recalls. In 1987, Gifford left CC&F to go into business for himself, founding a holding company for his business investments which included being the co-owner, manager, and investor in three local restaurants including the Harvest and starting a Faneuil Hall chocolate chip cookie company , Kilvert & Forbes, with pal, Senator John Kerry, (named after their mothers). Gifford also was the founding co-chairman of the Massachusetts Chapter of Common Cause. “Dun was always a ‘cause’ guy,” comments younger brother BankBoston President Chad Gifford. “His resume is much more interesting than mine. I’ve worked for the same bank for thirty years”. The elder Gifford did stints as CEO of the Nantucket Electric Company, as chairman of the London Harness Company, as a managing partner at Roscommon Capital Corp and also launched Gifford’s, a short-lived gourmet food mail order business. But although Gifford repeatedly refers to himself as a businessman, he readily admits that his efforts met with varying degrees of success. “I only worked in the corporate sector to meet the demands of supporting and educating four kids.” he explains. His passion for the big picture was stronger than his passion for the bottom line. And increasingly, his big picture passions took him into the realm of food and wine. Gifford first met Julia Child through his brother Jock who owned the Straight Wharf restaurant in Nantucket where Child and her associate producer and friend Marion Morash were cooking. The friendship was a rewarding one. Julia introduced amateur food worshipper Dun Gifford to the world of the food establishment. In 1984, he became Julia’s hand-picked chairman of the Massachusetts chapter of the American Institute of Wine and Food, the AIWF, a high profile organization that Child had founded along with vintner, Robert Mondavi. Gifford became chairman of the board of the national AIWF in 1988, a director of the National Wine Coalition in 1990, a trustee of the James Beard Foundation in 1991 and a corporator for most prestigious culinary school in America, the Culinary Institute of America, in 1995. Gifford was now sitting at the high table of the food world. But “being controversial is part of being effective” Gifford says and by 1990, Gifford had starting collecting detractors. People who suspected that he was more of a serious social climber than a serious social activist. His outspokenness and confidence in his superior vision grated on some. It all came to a head at the AIWF. 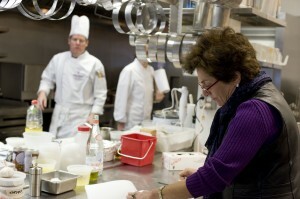 The AIWF was formally founded in 1981 by Julia Child and vintners Richard Graff and Robert Mondavi, actor Danny Kaye, chefs Jeremiah Tower and Alice Waters among others, to endow a serious educational center for the culinary arts and sciences to be located on the campus at the University of California at Santa Barbara. By all accounts, Julia Child devoted a huge proportion of her time to the organization – donating both her personal prestige as well as her personal checkbook. As other major donors were recruited, the AIWF hired a full-time executive director and began to publish a sumptuous magazine, The Journal of Gastronomy. Local chapters sprung up all across the country, with members meeting frequently for elegant fundraising dinners. Unsurprisingly, Boston, the home of the most recognizable apostle of the AIWF, Julia Child, became a major chapter and Dun Gifford her hand-picked first president. All give Gifford high marks for getting the local AIWF chapter rolling, but rumors of financial irregularity began to surface within the chapter with members divided over whether Gifford was the organization’s benefactor or a recipient. Gifford calls the rumors “ridiculous” and points out that he was one of the group’s major donors. In 1988, Child realized that the national office of the AIWF was in trouble after years of expensive merriment and mismanagement by its lifestyles-of-the-rich-and-famous board of directors and its highly paid executive director George Trescher, (a party-planner from New York who had managed Caroline Kennedy’s wedding among other splashy do’s). The non-profit had plunged into more than a half-million debt and Child asked Gifford to step in and sort out the mess. Gifford says today, that if he had known the true size of the deficit, he would not have taken the position. He choked when he sat down to go over the books. “They had spent money like there was no tomorrow. Here I was a brand new member of the board and a brand new chairman and I had to deliver an unpopular message of fiscal restraint to all these important people in the food establishment…Julia Child, James Beard, Robert Mondavi.. I’m a businessman, and it’s not a big deal to trim expenses, but it was not a popular message and I took a lot of crap for it”. Gifford objected to the “unreasonable” six-figure salary paid to the well-liked executive director and told the board that a pay cut was in order. In short, Gifford’s message to the AIWF board was, keep doing what you are doing, and you will sink. Simultaneously, philosophical rifts had opened in the AIWF with food activists like Alice Waters, chef-owner of San Francisco’s Chez Panisse, AIWF program director Greg Drescher, and author Nancy Harmon Jenkins who urged the organization to become more global and get involved in sustainable agriculture. On the other side were many of the most potent and vocal board members who really did not want to hear about pesticides and ecosystems. Julia Child says that she was not interested in “scaring people about food”. Nor were the large California wine-growers on the board not open to the gospel of organic agriculture. Ever one to think broadly, Dun Gifford’s evangelical soul became engaged in the fight. “I was against the dumbing down of the organization. I wanted the organizational to become more international in its outlook. I felt that if the AIWF didn’t pay more than lip service to the Alice Waters’ constituency – the young chefs who were interested in cooking healthy and saving the planet – it was in danger of limiting itself and never reaching its goal of becoming a 50,000 member institution,” Gifford explains. In 1990, after two years of regularizing the finances of the AIWF, Gifford simply resigned from the board at the end of his two-year year term. But the very verbal food world contradicts Dun’s version of the circumstances surrounding his departure from the AIWF. Many recall that he was asked to resign because the incoming executive director refused to take the job unless he did so. Clark Wolf, a New York based food consultant who Gifford had actually recruited to join the AIWF board, calls Gifford “a patrician carney…so big, so white, so melodious that he could be selling snake oil” and accuses Gifford of “being an opportunist – hiring his relatives, taking the organization’s debt from $300,000 to $600,000 and trying to develop his AIWF position as chairman into something which would allow him to do whatever he wanted”. In her 1997 biography of Julia Child, Appetite For Life, Noel Fitch Riley, states that AIWF benefactress Julia Child referred to Gifford’s behavior at AIWF as a “betrayal”. Gifford brushes off the book, noting that he has threatened to sue the publisher for libel and saying that “the passages about me are a total fabrication and the AIWF’s own books and records substantiate me. Julia knows better”. Child dismisses it all. She explains that “Dun sort of works in his own way and on his own things. He was already planning Oldways as he was planning to leave the AIWF”, she says. “I’ve always enjoyed Dun. He’s a lot of fun”. But the charges and counter-charges persist and rumors still circulate in the food world about whether Gifford resigned from the AIWF or was putsches -ed. The idea for Oldways came to Dun Gifford in 1990, in the town in China where Confucius was born. He was on an AIWF sponsored trip and had been to a banquet the night before – “forty courses, each one light as a feather”. For the past few days, he had been puzzling over the fact that all the chefs he met in China were either over sixty-five or under twenty-five. In Shanghai, he finally asked one of the men in the Chinese cooking academy where all the middle aged cooks were. Risking governmental disapproval , the Chinese instructor explained that during the Red Guard’s Cultural Revolution, cooking was considered a “bourgeois activity” and that all the chefs had been sent off for-re-education and all the cookbooks burned in huge bonfires. “Nothing was left. The splendor and tradition of Chinese cooking was gone. It all had to be re-invented”.. After the banquet, Gifford says he spent the whole night thinking, “the old ways have to be preserved”. And the idea flourished. Upon his return to Cambridge, Gifford went straight to the Bryn Mawr bookstore, purchased and packed off every book and old magazine he could find about Chinese cooking and mailed it off to his new friend in Shanghai. Out of this experience, Gifford began to conceptualize Oldways as a 501-C3 non-profit foundation which would do three things – 1)recognize and celebrate the entwined traditions of culture and food, 2) support research into healthy diets and sustainable agriculture, and 3) use the media to educate the population on what to put on their plates and in their mouths. Using his native skill for promotion and marketing, Gifford forged alliances with nutritionists at highly regarded institutions such as the Harvard School of Public Health and the World Health Organization. Greg Drescher, the imaginative program director from AIWF transferred over to Oldways as did Nancy Harmon Jenkins. Another early Oldways recruit was the International Olive Oil Consortium (IOOC) who pulled their sponsorship from AIWF to follow Drescher and Gifford to Oldways. Although accusations swirl within the food community, Gifford contends that Oldways neither “stole” sponsors nor talented staff like Drescher and Jenkins from AIWF; The money and talent flowed to Oldways as a consequence of support for the Oldways’s agenda. Clark Wolf, still a member of the AIWF board, counters that “two is not enough for Dun’s faces”. Despite much industry backbiting, Oldways has flourished. At a seminal 1993 conference presented in conjunction with the Harvard School of Public Health, Oldways unveiled its Mediterranean Diet Pyramid. The pyramid had emerged as a result of an earlier Oldways conference which Associate Professor Frank Sacks credits as being the moment where scientists, chefs, and the media simultaneously discovered or re-discovered academic findings made in the 80’s which suggested that a diet high in natural vegetable fat led to the lowest levels of coronary artery disease. “The discussion about the superiority of the Mediterranean diet became mainstream as a result of Oldways. Dun is a brilliant communicator and synthesizer. He can talk scientists, chefs, the media, historians and anthropologists and gain respect in all quarters,” Dr. Sacks says. Barbara Haber, curator at Radcliffe’s Schlesinger Library gives Gifford and Oldways much of the credit for creating the trend towards Mediterranean cooking. “Dun waged a very classy kind of educational campaign to publicize the health benefits of the Mediterranean style of eating. No dancing bottles of olive oil. The beauty is that it’s a delicious product”. Gifford, acting as an Olympian scale dinner host, took his quarries on fabulous field trips. Organizing research conferences in exotic spots such as Porto Carras, Greece, Barcelona and Seville, Istanbul, Tunisia, Morocco and Tuscany, all locales where the local eating patterns reflected traditions to treasure and a quality of life to emulate. The guest list was assembled with savvy – top level food writers, academic nutritionists, historians, anthropologists and chefs who all were able to get an overview of where food fits into culture. Boston Magazine food critic, Corby Kummer, who went on several of the trips, calls them “ a food writer’s Fulbright”. The Mediterranean Pyramid has now been joined by siblings : an Asian pyramid, the Latin American pyramid, and the Vegetarian pyramid have been added to the family. each reflecting a different cultural twist on healthy eating. Oldways has become an international organization with more than 400 hundred sponsors underwriting its annual $ mm budget. Initiatives such as Chef’s Collaborative, a powerful national organization of more than 1500 chefs who are dedicated to organic farming and sustainable cuisine has been created under Oldways aegis. The group supports local farmers and operates far-reaching educational programs to get the message of healthy eating into the classrooms. Chris Schlesinger, chef-owner of the East Coast Grille and one of the founders of the Chef’s Collaborative, credits Gifford and Oldways with “framing the discussion, and giving (him) a real perspective on the way food binds cultures together”. Jody Adams. chef and co-owner of Rialto, says “Dun is a visionary”. Even the cranks at the USDA now give grudging approval to the Oldways pyramid. In the April 1997 Nutrition Insights bulletin, the USDA admits that “the Oldways Diet pyramids illustrate eating patterns consistent with current nutritional recommendations”. Translation: Oldways got it right. And Gifford, luxuriating in the excitement of the adulation and of being in the thick of social change, couldn’t be happier. “I’ve made a lot of enemies, but I have a lot of friends. I calculate my success based on how many minds I’ve changed each day.” So every time you reach for the olive oil, remember to thank Uncle Dun. I figured on an hour. Easy in, easy out. Little did I imagine that I would jet into the Natural Products Expo East in Boston and stumble out five hours later with three shopping bags (yes, re-useable and heavily logo-ed) brimming with business cards, brochures, and mini samples of everything from silver ionizing healing cream and nasal cavity washers, to gluten-free pizza and rare tea blends. Plus, an added bonus during my workday hours: much useful and highly personal advice on how to protect myself with probiotics, perform a toxic cleanse, and use crystals to change my aura. It’s the Fancy Food Show for the New Age set. And it is a hoot. Hundreds of booths, wafting aromas of lavender and ozone, many peopled by people who resemble the guys who testify after encounter with UFO’s, but a lot of savvy, suited-up marketing people offering studies and statistics, and spiral bound presentations with their competitive advantage. I know that big companies like Pepsi, Kraft, and Coca-Cola now own many of the leading natural products. It’s just surprising to see what their entrance into the formerly-Mom& Pop, crunchy-granola world of natural products has meant to the explosion of the industry. And I don’t think it is bad at all. Being a food writer with a gluten allergy, my personal quest was to see what new, potentially edible, gluten-free products were coming to the market. I imagined a teeny corner of a not-so-major expo where I might find one or two crackers and cookie mixes good enough to serve my civilian guests. I was astounded by the sheer depth of the offerings––not just for gluten-free folks, but aisles of products that were cross referenced and segmented for every known food sensitivity—no eggs, booth 1178. No dairy, take a left to booth 1276. Tree nuts and peanuts? The whole aisle over there. The niche is huge and by the number and the sophistication of many of the vendors, I suspect quite profitable. Yes, as someone with an allergy I will happily pay more for a product whose claims I trust. Every product label carried an organic logo, called attention to its ingredients locus of origin, and is readable without a magnifying glass. Many of the people staffing the booths come with a story attached. For me, a veteran story-sharer, cruising the entire trade show was like eavesdropping on the true confessions of people with food issues. A mother whose two sons were diagnosed with a peanut allergy. A woman diagnosed with celiac in her mid-forties and longing for a cracker she could bring to a cocktail party. A man who suspected he had allergic reactions but couldn’t find a diagnosis. A younger man whose own diet concerns led him to develop a wheat-free granola with “live” grains that helped him lose thirty pounds, and clear up his skin! Food as medicine, developed by consumers and food professionals with a problem to solve. I was thoroughly ill when I reclaimed my car from the convention center valet. But I was also enormously impressed. First, at the sheer number of food entrepreneurs operating in a niche market for allergy friendly foods; second at the fact that so many of them have a personal connection to the need for the product; and third, with products that are both responsive to allergy concerns and to conscience. An awesome responsibility. I was a judge, clipboard in hand, fork at the ready. Sitting in judgment over the skills, the menus, and media demeanor of eight aspiring cooking school students hoping to win the New England title as the next “Almost Famous Chef. ” A win is a trip to the Culinary Institute of America in Napa Valley for the nationals, $10,000, stages in Europe, and professional connections up the wazoo (maybe). Losing is a few photos for the school and some nice additions to their knife kit. Almost Famous a five-hour competition at Cambridge Culinary School in Cambridge. Each student chef cooks a challenging entrée, prepares it from scratch, under time pressure and the gaze of three sets of judges—instructors from the local professional Culinary Schools—who watched over kitchen technique, sanitation etc; four professional chefs—Jody Adams of Rialto and Jay Murray from Grill 23 and two other chefs, one from Newport, RI, and the other from Vermont. The professional chefs were given a complex 25 -point judging template, with precise guidelines on how to deconstruct each student chef’s dish and professionalism. My task was simpler: rating the chefs on media presence, and the ability to stay on message with the distraction of ten judges, four videographers, several sponsor reps, and a still photographer milling around. No joke: it was one of the most stressful five hours of my life. Here’s why. Cooking competitively is not an artifact of TV hype. It’s hard work to do, and hard to watch. The chefs––from their forties to their teens, career switchers and green as grass gangly newcomers–are the top students at Cambridge Culinary, Johnson & Wales in Rhode Island, Bunker Hill Community, and New England Culinary Institute in Vermont. They worked hard to get here today, spent days engineering dishes creative enough to show their spark, yet not so dicey as to be impossible to produce under pressure. I ached for “Jenny”, competitor contestant #1, a Korean woman in the US only since 2003. By lottery, she was the first chef to begin. The subsequent competitors came on stream at half-hour intervals so finished dishes could judged hot out of the oven. “Jenny” made a classic herb-crusted rack of lamb with a celery root puree, and asparagus Polonaise. She worked like a demon. Head down, hair back, lipstick on, hyper-focused. Her technique was flawless. Her timing was not. And her communication skills? A recent immigrant, you could hear her formulating her answers word-by-word. The judges cooed over her Polonaise. Most of us had never seen the technique—separating raw egg yolks, freezing them for an hour, and then rolling them in Panko crumbs and a fast deep-fry so that when fork met egg on dish, it was the perfect yolk of a perfect fried egg, a runny simple sauce. But—the judges found the lamb raw, the plate cold, the dish under-seasoned. Laborious, beautiful, but not up to snuff. Next, another aspiring chef, a refugee from advertising, studying at Cambridge Culinary and working at Blue Ginger. He was media magic, but his dish was too fussy. And horrors! He used lecite powder, a lecithin derivative popularized by Ferran Adria to make the coconut foam. Chef #2 got high marks for grace under pressure, but his oolong-tea smoked scallops were raw and cold, and the chefs couldn’t taste the saffron in the rice cakes. Next up, a sweetheart chef from Texas studying at NECI, making a beef tenderloin topped with rendered bone marrow. She overcame a kitchen disaster, and did well—but not well enough to win. By 6:00 PM, all eight chefs were working away, while an official with a digital stopwatch barked time codes. The judges had chatted up most of the chefs, wondering why one was using this kind of polenta and not that, worrying that chef #1 wasn’t going to get her lamb into the oven in time. At 7 PM, we judges sat down. One by one, the chefs presented their dishes. We went to work. Tasting each morsel. Feeling the anxiety. A serious task undertaken by a serious team, knowing what it would mean to the young chefs to win. I wanted to throw up—not from the food––on the whole pretty good––from the tension. Hopeful faces under crisp white toques. Two chefs almost tied, but Erik Powers (20), a young man from Everett studying at Bunker Hill is going the Almost Famous Chef Finals in Napa. His meal—a beautifully executed pan seared cod wrapped in pork jowls, (guanciale), came out hot, pretty, and perfectly seasoned. Luckily, his mom was to hand to witness the triumph. The chefs stayed to party on. The judges, totally spent, made a beeline for their cars.